Imagine Google Maps, but overlayed with layers of digital information, from cell phone usage to GPS activity – anonymously aggregated and available to the public. Starting today, Wiki City Rome is displaying just such data on one of the busiest urban centers in the world. 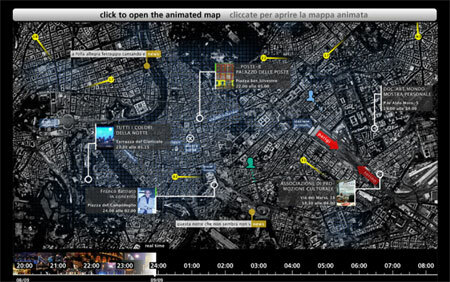 An MIT SENSEable City Laboratory project, Wiki City Rome seeks to create a “Real Time Rome” from various data sources. The net result: a composite and continually updating data image of the city displayed on top of a map of Rome. Shown above: a concept sketch (left) and cell phone activity around a Madonna concert (right). Having just gone live, Wiki City Rome maps are currently being displayed around Rome on huge billboards during the city’s Notte Bianca festival. It both reflects and reacts to the movements of the Roman population. The data being displayed is perhaps not terribly impressive, yet anyway, but the idea is quite compelling.